Today is the first post in my new series, Frugal Friday. Every Friday I will feature an affordable drugstore product. Having a regular series is one of my blogging goals for 2014 so hopefully you guys will like this! The lovely Lily at Beauty with Lily recommended the L'Oreal Telescopic Carbon Black mascara to me when I saw a photo of her where her lashes looked amazing. You can find this mascara at drugstores for less than $10 and maybe even cheaper if you get it on sale. The wand is super skinny, the skinniest I've ever seen. I actually prefer these kind of rubber, spiky wands rather than the feathery brush-like wands. I feel that they separate lashes really well. The formula is not too wet which I like and because of the wand, there are pretty much no clumps. My lashes look long and nicely separated. 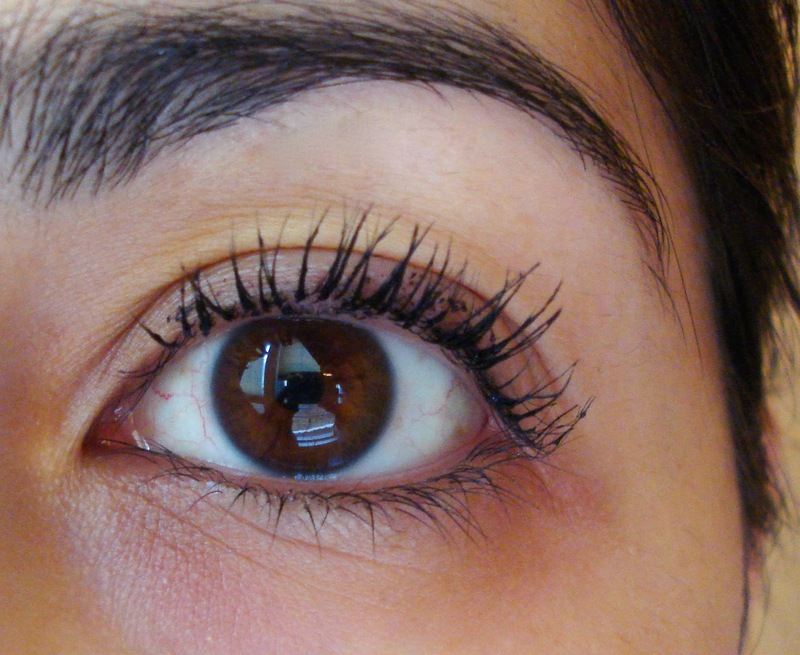 Below are my lashes with one thick coat of the mascara. 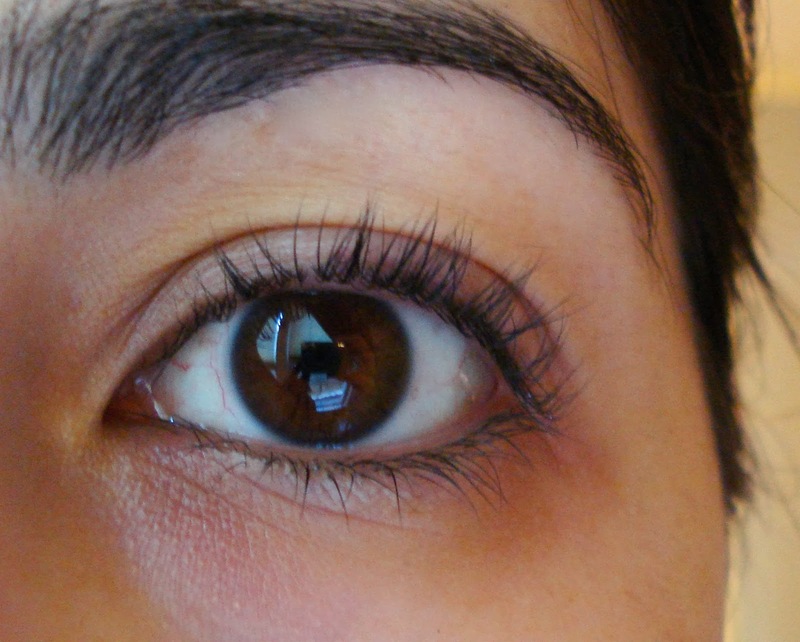 You can see my lashes are nicely separated, look darker and more voluminous. Excuse the mess on my upper lid, on a normal day I'd have shadow and liner to camouflage all that but I wanted you guys to see just my lashes with no other makeup. Two thick coats is where things got a little wacky. My lashes started to get stuck together and got really clumpy. Overall I really like this mascara! I will probably never do two thick coats because I prefer a more feathery look to my lashes. I hope you enjoyed this mascara review and and my first Frugal Friday post! Have a great weekend everyone! 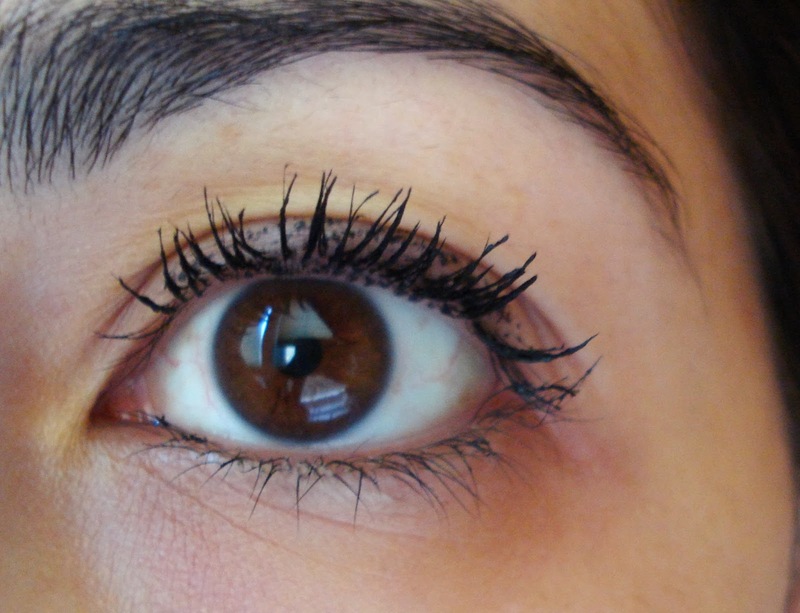 I have the normal telescopic mascara and LOVE it! I swore blind I'd never buy any other mascara than Maybelline Volume Express Colossal.. but I read a blog post on the L'Oreal telescopic and saw the pics and was intrigued.. and now I'm in love. There's no false advertisement, it really does what it says! Oh that good to know about the regular Telescopic mascara! Thanks for visiting! Yeah, I do like one coat and you're right, it's natural enough that I can wear it to work during the day. Thanks for stopping by! Thank you for your sweet words, you're a doll! I really love this mascara, I usually do 2 or maybe 3 coats of it. I also really like that it's easy to take off, some mascaras are so hard at removing. I'm glad you are enjoying, it looks great on you! Thank YOU for the recommendation! Oh yes I forgot to comment on that, that it's easy to take off even though it's dark and can get dramatic. Great Review! I am always on the lookout for great mascara's! Does this mascara smudge at all during the day? It didn't smudge on me. You should try it out! I have not tried this version of the Telescopic. I have tried the Shocking Extensions and I do enjoy it. It doesn't completely wow me but I bought a back up tube which I haven't cracked open yet. Great review dear! Thanks so much for sharing with us. This is not a "wow" mascara either but it's def. a good one. I'll have to put the Shocking Extension on my radar. Thanks for the suggestion! Great review. I need to try this. Well, the mess is partially the formula and partially my shaky hands haha! I've def. used better mascaras but this is def. a good one! I could use more frugal Fridays seeing that this is usually the day I spend the most! lol. But, I have this mascara & love it! I just wish higher quality mascaras possessed the same brush because I find myself cleaning L'Oreal's & using it for my other mascaras! I was actually thinking of keeping this brush after I'm done w/ the mascara and trying it with different mascaras and seeing what happens. That would def. be interesting! Thanks for stopping by!